Something very different is a visit at a medieval christmas market inside the medieval Ronneburg castle in Germany. A group of men in medieval garb, sell their wares at the annual christmas market at the Ronneburg Castle in Hessen, Germany. The sights and sounds of the medieval times come alive during the Christmas market in Ronneburg as maidens and knights sit on wooden benches and enjoy the food and drink on offer while blacksmiths fashion metal with their hammers. People dressed in medieval clothing during the medieval markets on the grounds of Burg Ronneburg (Burgmuseum), Ronneburg Castle, Ronneburg, Hessen, Germany, Europe. 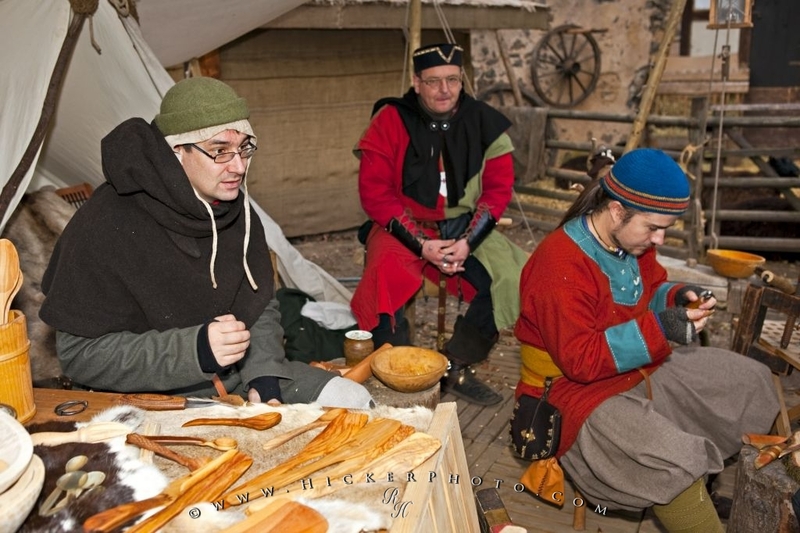 Photo of men dressed in medieval costumes during the Christmas Market at Ronneburg Castle, Germany.